1. Abstracts MUST be submitted electronically via the online submission system by the given deadline 11th of January, 2017. Abstracts received via fax, e-mail or received after the deadline will not be accepted and therefore will not be considered for the programme or publication. Applications are made on a first-come, first-served basis. 4. 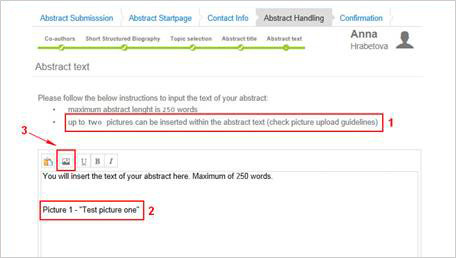 Once the abstract is “submitted” (through the “submit” button) it can no longer be changed. Abstracts can only be amended if requested in writing to the PTCOG56 Scientific Programme Department by the 11th Janauary, 2017. 5. All abstracts will be reviewed by the PTCOG Scientific Program Sub-Committee, who will consider its formal aspects and the content. They will decide which abstracts will be accepted and may reconsider the final presentation type. 6. Accepted abstracts will be published in the Abstract Book. Abstracts not suitable for display will be rejected. Please have your abstract checked for correct spelling, punctuation, grammar and formal structure. The organiser reserves the right to edit abstracts if necessary prior to the publication in the PTCOG Annual Conference Abstract Book. 7. All presenting authors will receive an acceptance/rejection notification via e-mail by Friday 3 March 2017. 8. All presenting authors are obliged to register by 15 March 2017. 10. When submitting your abstract, consider and choose the appropriate category, scientific topic and the presentation method. 11. The abstract title is limited by 20 words and must be submitted using the sentence case (eg. This is the title of my abstract). 12. Up to 10 authors can be submitted for one abstract (including the presenting author). The presenting author is selected first; other authors can be added only when the presenting author is submitted. However, the author order can be changed if needed by swopping the names in the list of the co-authors. 13. The maximum abstract length is 250 words. 15. The number of submitted abstracts per one submitter/author is not limited. 1. Place the picture title within the abstract in the location where the picture should appear(2). 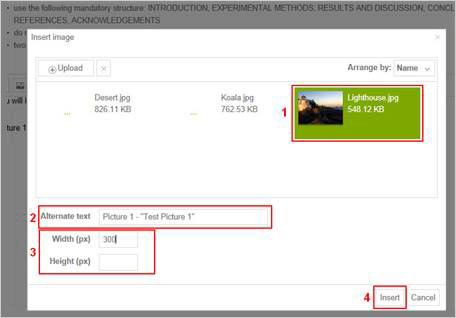 Click the “Picture Insert” icon to start the upload process (3). 2. 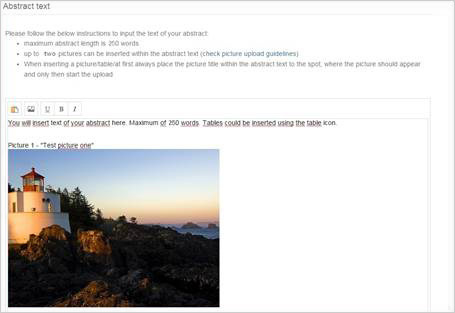 Click the “Upload” button (1) and select the picture you wish to insert from your computer. It will be uploaded to the insert image gallery (2). 4. When the picture is uploaded, the correct location and size can be checked. 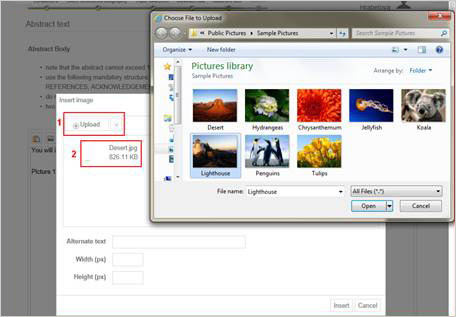 If you wish to change the dimensions you can simply delete the inserted picture and upload it once again with a different size.